I’m amazed at all of the One Room Challenge reveals this week. The best part of this challenge is that it gets things done. It’s amazing to see so many rooms that have been waiting to be done for years and in 6weeks time they are beautifully done. This challenge is so great because it gives accountability first and foremost and secondly because the participants cheer each other on and the fun part is in doing it all together. It’s almost like a marathon, everyone running together to the finish line. Congrats to all the participants on a job well done. To see the impressive interiors, visit the One Room Challenge site to see the featured designers as well as the guest participants. And if you have a room that you’ve been planning to finish, just decide to do it and you will not regret it. Spring challenge is next so if you don’t get a room done by then, you know who to call to get you to that finish line. Remember the first blog post with the before photos? The blue carpet is long gone and the room is now ready for guests. After the last challenge in the Spring I’ve had a couple of people tell me that I’ve inspired them to do their own One Room Challenge and it just made my day. It was such a pleasant surprise and I will be more than pleased if this One Room Challenge project inspires at least one person. Here are the before photos followed by the after. Enjoy! Thank you to West Essex Lighting Studio for sponsoring me and for keeping me accountable to finish this challenge. The lights certainly act as the art piece and light in one. I just adore this sculptural light and hope you do as well. From the comments I’ve received, seemed like everyone loved the light fixture I selected and hopefully everyone will love it even more in the space. The best part aside from it looking fantastic in person is that it’s dimmable and the globe looks magical when it’s lit up in the evening. The simplicity and creativity of this light certainly shines. Happy to have incorporated art pieces that used to hang in my grandmothers’ home and to have incorporated a rug that was used for many years as a wall hanging in my other grandmother’s home. The rug waited so patiently to be cleaned for almost 5 years and it is actually what inspired me to get this room started. Lots of different pieces coming together in this room including this table that was no longer needed at my husbands office and found it’s new home here. And just like that a reading, studying, chatting area was born. Of course it wouldn’t be a room by me if I didn’t add a touch of whimsy. As if the hotel bell on the nightstand was not enough for some laughs, I just had to get these grass flip flops and you know what, it’s been a great hit with those who have seen the room in person. Why not have a little fun every now and then, right? Had a blast creating the fresh flower arrangements for this challenge and the room smells fantastic! And as we all know it’s always great to kick your shoes off once in a while and walk in the grass even if it’s inside. Sky’s the limit for sweet dreams in this guest bedroom. Come on over and be my guest. 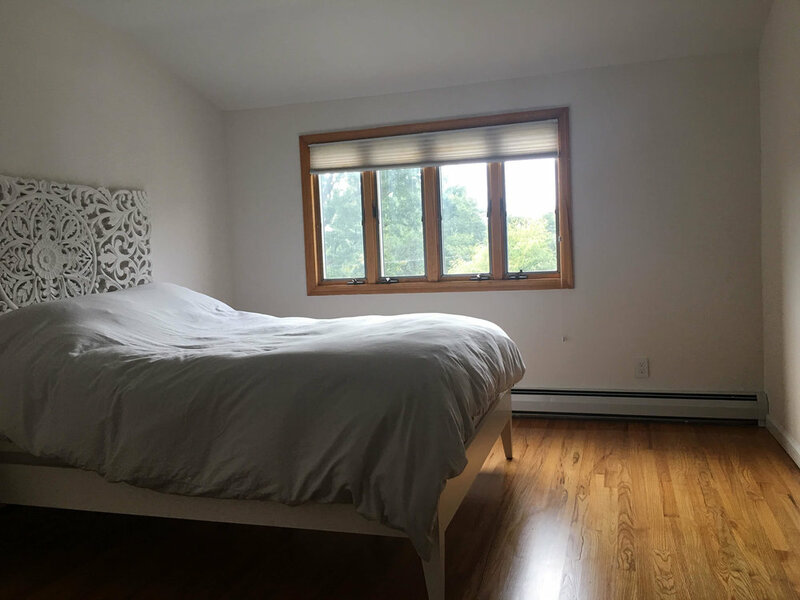 And if you need to create a guest bedroom retreat for your guests or better yet yourself, feel free to reach out!